With great thanks to all from Age Scotland. 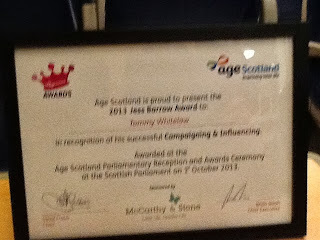 I feel very honoured to have received the Age Scotland Jess Barrow award 2013 for campaigning on dementia and caring. 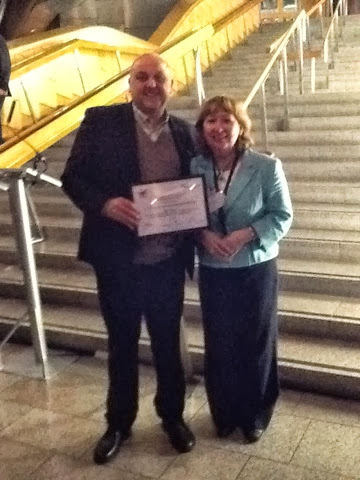 Thank you so much for this award and for a really inspiring evening at the Scottish Parliament. Congratulations to all the nominees and winners across all categories, I was very inspired by all I heard and witnessed . I will update more tomorrow with some photos, I am on on my way to Cardiff to speak at the Alzheimer society wales conference. Thank you Age Scotland from a son and thanks to everyone who has participated and supported me on this campaign. Congratulations Tops Tommy and honour to have known and followed you via twitter and on here.